Going to watch a gig by a solo instrumentalist may not seem like the most riveting prospect to any newcomers of the genre. The idea of witnessing a lone figure playing music with no vocals and frequently pausing to tune his instrument does not readily fills one’s thoughts with enthusiasm for the event. Fortunately for any such doubters, this is far from the case with acoustic guitar maestro Andy McKee, as revealed at tonight’s performance in Exeter. Aside from his awe-inspiring guitar playing techniques, which leave the crowd in a constant state of captivation, the Kansas-based solo artist also manages to keep the audience amused with an acceptable level of banter in between songs. From the moment the former internet phenomenon takes to the stage for his latest gig at the Phoenix, it is clear from the response in the packed venue to see how far he has come since those early YouTube videos. Following the release of his sixth album ‘Joyland’ last year, from which many of the song’s in tonight’s set are taken, Andy returns to this side of the pond to perform for his growing circle of UK fans. Starting with a much earlier track ‘Common Ground’, the opener from his 2004 second album ‘Dreamcatcher’, Andy instantly manages to grab the full attention of tonight’s crowd. Being the only musician present on stage, it is quite incredible to discover just how entertaining one man can be with only a single instrument. His astounding blend of finger-tapping and percussive techniques makes it near impossible to look away when he is in full flow of his unique playing style. This is made all the more obvious by the almost eerie silence that overcomes the venue during each song. This silence becomes even more noticeable when it is deafeningly shattered by the eruption of applause that occurs upon the conclusion of every track. Andy follows tonight’s set opener with a couple of covers, starting with a song by “one of my favourite bands from the ‘80s – Tears For Fears from Bath” or “Bath”, which he pronounces in a comical English accent, prompting a resounding chuckle from the crowd. His version of ‘Everybody Wants to Rule the World’ makes the full-band effect of his music more apparent with the familiarity of the track. The recognisable vocal melody from the original is played seamlessly over the rest of the song, highlighting the irresistible appeal to Andy’s music. The altogether most shocking and amusing occurrence in tonight’s performance is the inclusion of Andy’s harp-guitar. An instrument that looks, as Andy accurately describes, as though it has been “taken straight out of the set of Star Trek.” In addition to its odd appearance, the harp-guitar’s sub-bass strings create a sound that could easily compete with the din heard from any of the Phoenix’s neighbouring dance clubs. Prior to returning for a brief encore, Andy finishes tonight’s performance with ‘Drifting’, the track that helped to make his name on YouTube. Ending the set with the song that started the career. 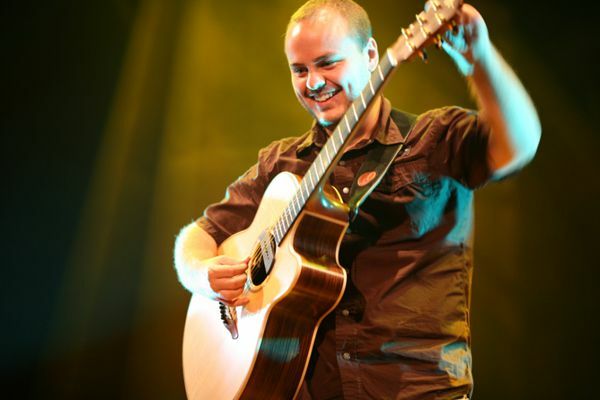 So what’s next for Andy McKee? As the fanbase visibly grows, there’s blatantly no reason for stopping just yet. Quite the opposite, in fact. As one of the most inventive guitar players the world has to offer at the moment, it seems that the journey is far from over. GUITARIST ESTEBAN ANTONIO UNVEILS NEW CORNISH-MADE TRIPLE-NECKED, 17 STRING GUITAR.